Successfully Added RC Car with Spin Action to your Shopping Cart. RC Car with Spin Action. This incredible car is everything you have always wanted from a remote control racer and more! This red speedster will easily burn up the track. With a powerful engine and smooth, responsive feedback from the remote control, you will be tearing up the streets in style with this monster hotrod! The car is beautifully detailed with an authentic design to replicate the real thing. It may look small, but this racing car was built with one thing in mind: speed! Fitted with a massive rear spoiler, push this car to its very limits. Be the king of the racetrack with a spectacular toy that is great to watch as well as control. With its distinctive red body, this car will crush the competition and rev its way to victory. Constructed using high quality molded plastic, this robust and rugged terror on the tracks will keep you thrilled with many hours of entertainment. Pull off electrifying moves by using the spin control on the car. Coming with an 8-directional remote controller, two thumbsticks give you forward and reverse throttles, plus left and right directional steering for pinpoint accurate driving. The controller is fast and responsive, ensuring you are always in complete control of the intense racing action. This is a true racer's dream come true. 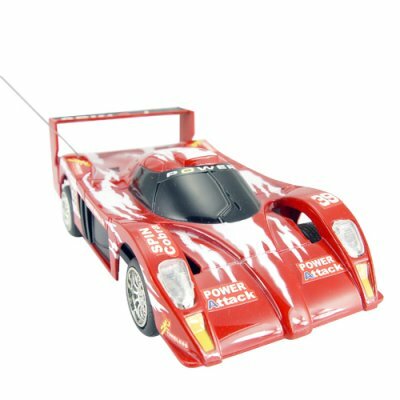 Featuring incredible performance, silky smooth responsive feedback and an aerodynamic design, this RC toy would be the perfect gift for family and friends who enjoy racing cars and high performance cars.